London to mark digital switchover with Crystal Palace lightshow | What Hi-Fi? Seventy five years of analogue TV broadcasts in London will come to an end at midnight tonight when the analogue signal is turned off for good. Around five million homes will make the switch to digital TV. BBC Director General Mark Thompson will be at Crystal Palace tonight to mark the occasion. From tomorrow, April 18th, Crystal Palace and 52 relay transmitters across London and the Home Counties – from St Albans to Dorking – will switch to a new high-power digital system for Freeview. 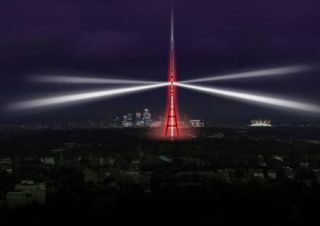 Arqiva, the company behind the £630m digital switchover project, plans to light up Crystal Palace on April 18th and 19th in celebration. London finally completes the switchover to digital TV on April 18th, and to mark the occasion there'll be a 'spectacular' lightshow at the Crystal Palace broadcast tower. More than 200,000 watts – 7.5 billion candlepower – of energy-efficient lighting will be used to illuminate the 219-metre-tall structure. That's the same wattage used to light the Eiffel Tower in Paris. The explosion of light will be visible all across London and will culminate with a beam of light shooting up the tower and radiating out over the city, representing the invisible digital TV signals. Arqiva, the company which has engineered the UK's digital switchover project, is installing more than six tonnes of lighting equipment on the tower in readiness for the light show at 9.15pm on April 18th. • If you still haven't switched to digital TV, check out our reviews of Freeview set-top boxes.